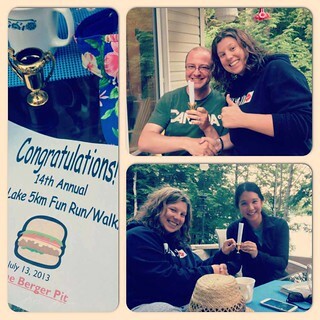 The Berger Pit Fun Run at Kristen’s family’s camp was the first 5k I ever ran. In July 2013 I was excited to return and bring Dan with me. It was a blazing hot day and very different from the last time I had run it. It was a smaller group, but still fun. Kristen is like the Kara Goucher to my Shalane Flanagan (at least back when they trained together anyway). Dan ran with Kristen’s friend Mike and his dog Maximus. Kristen and I ran with two of our four-legged friends, Indiana and Maggie. I feel like Maggie and I go way back. When Maggie was a puppy and Kristen and I first started running together we often took her out with us to start training her to run. Paul walked the 5k this year because he was recovering from knee surgery following a car accident. He walked the entire 5k and did an awesome job, finishing strong. Maggie was excited to run with us and started sprinting and pulling me along. I kept yelling “Maggie Maggie Maggie! Control your pace! Control your pace!” as she dragged me up a hill, leaving me breathless. Finally I was able to get Maggie down to a regular speed and she trotted along beside us contently. I had been wearing my oversized sunglasses on my head and suddenly realized that I’d forgotten to take them off. So I spent the whole run balancing them on my head and readjusting them accordingly. Despite that, I had a good time. Kristen and I ran beside each other with the dogs chatting. It was like old times, except we were in better shape now. The last time we ran the Berger Pit Fun Run together we ran to the stop sign and back. This year we ran to the bridge with everybody else. 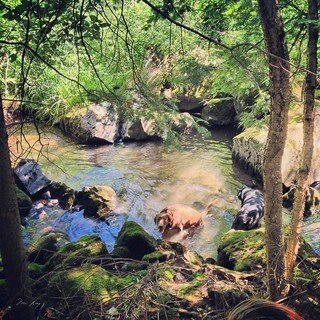 Maggie and Indiana cool off in the creek halfway through the 5k run. Partway back to the Berger Pit Kristen noticed Indiana walking funny. 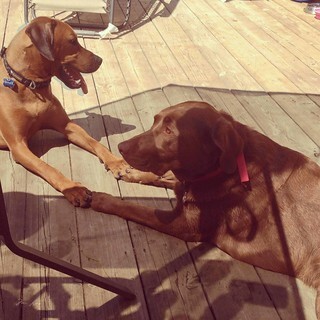 She checked his paws and his pads were raw (he had been having issues with them before but they had seemed healed enough to run). Worried, Kristen called Sue who was back at the Berger Pit and she drove out and picked him up. We finished the run feeling strong. Kristen even mentioned that my running had improved! (I was marathon training at the time so it was awesome to hear that the training was paying off!) Now was the best part of the run. 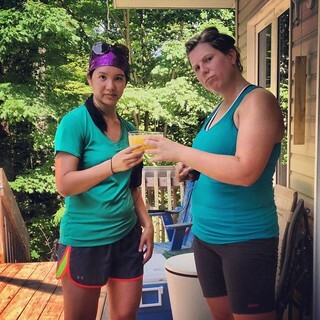 We drank our mimosas and then jumped into the lake to cool off. It felt great! We spent the rest of the day eating (there’s always tons of delicious food at The Berger Pit) and drinking. More people arrived and a bunch of us ended up tying some floatation devices together to create a “floatilla” and then we all lay around on the water, floating and enjoying the day on Cloudy Lake. 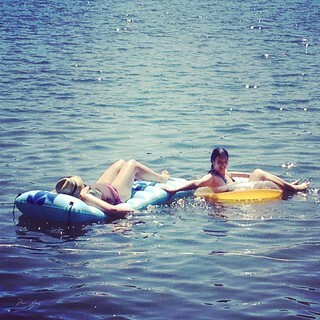 Lounging on part of the floatilla. At one point we had at least 6 people hooked together and floating around lazily. 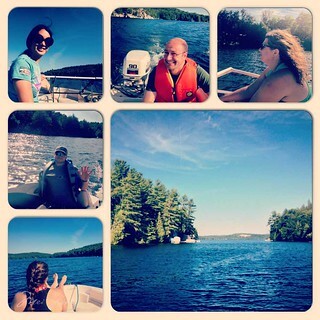 After dinner Kristen took some of us out on a boat ride around Cloudy Lake and McCarrel Lake. 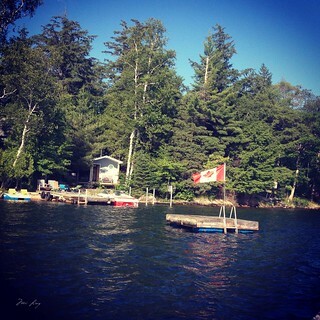 It reminded me how beautiful northern Ontario is. We ended the night with more food and drink. Kristen also officially presented us with our 5k trophies and certificates. Somebody brought this wine to The Berger Pit. 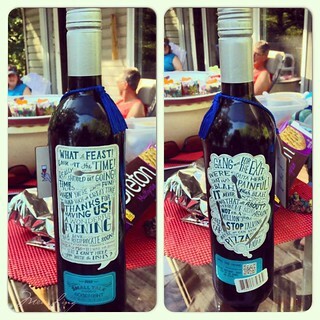 I love the label! Our trophies and certificates. So proud of our accomplishment! As always, I had a great time at The Berger Pit and hope that I can make out for the fun run again this year. Kristen and I said goodbye, but knew we would see each other again soon, because we were going to Ireland in a week! More on that later.